The area around the Rogers Arena and BC Place use to be a bit of a wasteland for quality eats at a moderate price. If I already paid $$$$$ for a Canucks’ game or concert, I often don’t want to spend a lot of money for a pre-event meal. However the area is slowly gentrifying with Condo towers full of hungry people, and as a result the number of restaurants offering tasty moderately priced meals is increasing. 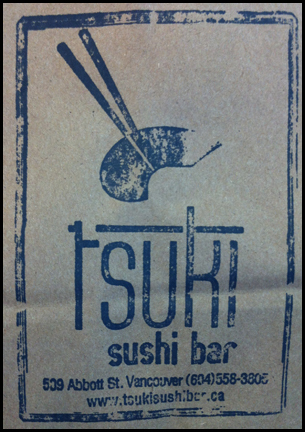 Recently I walked by Tsuki Sushi Bar and did a double take. They were offering Chawan Mushi as a daily special! This savoury steamed egg custard is similar to Chinese steamed eggs, and contains various combinations of small pieces of seafood, meat, shitako mushrooms or leafy greens like spinach. Dashi broth is added to the gently beaten egg (to prevent air bubbles), combined with other the other ingredients and steamed. – since Chawan Mushi is an “attentions to details” offering, it tells me the restaurant is more concern about preparing their food correctly instead of pumping out items & turning over tables. Despite the plethora of sushi places in Vancouver, Chawan Mushi is a rare offering. It’s a very old school Japanese dish and when I do find it on menus, 8/10 times the restaurant is run by Japanese staff and has a Japanese clientele (think Aki’s & Kimura’s when Kimura-San was there). Upon my first visit to Tsuki, a staff that was mostly Japanese greeted me. 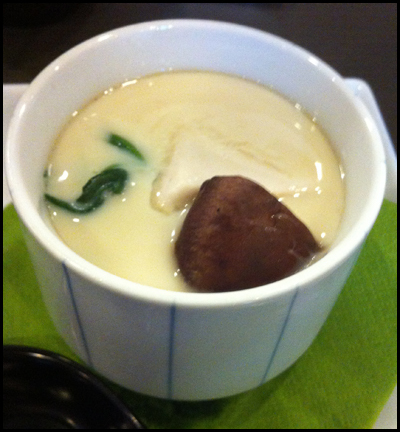 I ordered the Chawan Mushi and another daily special, Gindara Saikyo Yaki (grilled miso black cod). The egg custard was silky smooth and savoury. Tsuki used a whole shrimp, spinach leaves, a quarter of a shitaki mushroom and a slice of tuna in their Chawan Mushi. It was well prepared – no air bubbles and soft like silken tofu. 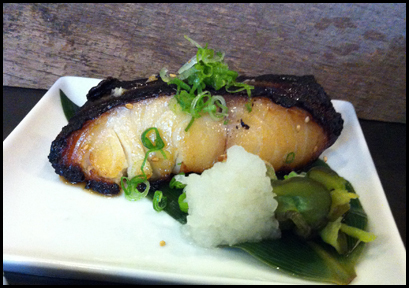 The grilled miso black cod came with a small side of Japanese pickles. The fish was well marinated but it was a bit over cooked in some spots. It also lacked charring you would expect from grilling. 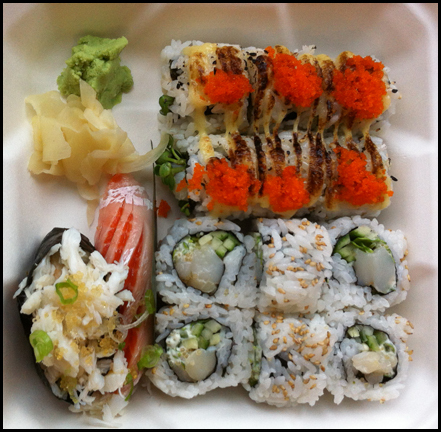 I enjoyed my first meal and decided to get some take out to test out Tsuki’s sushi items. The first box contains Roll Combo D (Dynamite Roll & Special Chopped Scallop Roll), Kani Special Gunkan and Salmon Toro Nigri. 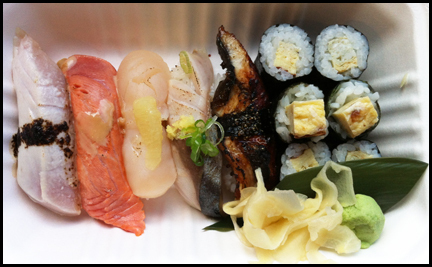 The second box contains their Aburi Special and a Tamago roll. The sushi rice was seasoned subtly and not too soft. 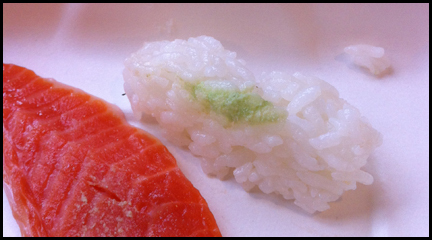 Continuing with tradition, wasabi was found underneath each piece of fish in every nigri. The Dynamite Roll was a surprise, as the prawn in the roll was not battered. Re-checking their take-out menu I realize Tsuki doesn’t offer any deep-fried items. I actually like this version as I thought the sweetness of the prawn shone thru. Having the outside of the roll, in particular the Tsuki sauce, passed under a flame added another level of flavour to this unique rendition of a Dynamite Roll. 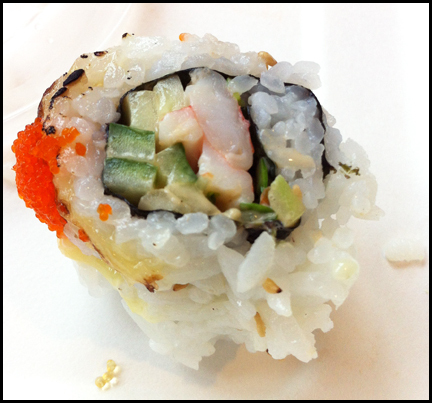 The freshness and sweetness of the Dungeness crab in the Kani Special Gunkan was another highlight of the take out sushi. Unfortunately I thought some of items were under torched and as a result you could not taste the charring on all the pieces. In addition, the Tsuki chef chose leaning cuts of seafood for some of the combo, such as the tuna, salmon and scallop, which I don’t think work as well for the aburi technique. 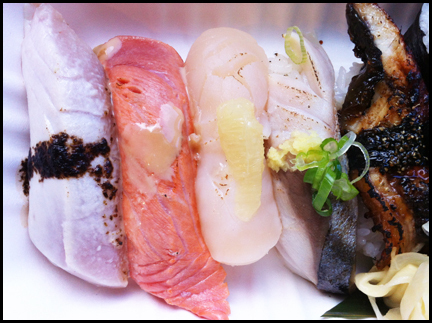 The fattier Saba and Unagi on the other hand really benefit from have been torched. The heat released more flavour trapped in the fishes’ fat and made those 2 nigri delicious. I think there is room for improvement in terms of execution at Tsuki. However, the creativity of the chef and the attention to details is present at this sushi joint and it definitely improves the dining landscape in the Crosstown area of Vancouver. Next Post Wow, You’ve Got Something There! – The Cheeky Boys from Le Tigre.